Be honest: when was the last time there was a straight-up action movie making waves in theaters? No superheroes, space ships, young adult novel writing, or any franchise attachment to it, just a story about a blunt tough guy shooting and/or punching people in the face. Aside from 2014’s John Wick there doesn’t seem to be a big market for those kind of movies any more. Whether that’s a good or bad thing is debatable, but it’s hard not to wish for an action movie to just shut up and start shooting without divulging into a muddled mess. Case in point: The Accountant, a cross between John Wick and Jason Bourne that thinks it’s so cool and clever that it doesn’t know how far it’s stuck its foot in its mouth. The title character is Christian Wolff (Ben Affleck), a brilliant but socially awkward accountant living in solitude and helping locals uncook their books. He gets a job for a robotics company going through their financial records after an employee (Anna Kendrick) finds an error in recent transactions. When Chris finds the error to be accurate, he’s told to back off and is marked for dead. But according to the research of a U.S. Treasury agent (J.K. Simmons) and analyst (Cynthia Addai-Robinson), Chris has been cleaning up the finances of mob bosses, arms dealers and terrorists for years, and he’s not shy about throwing fists and pulling triggers. It is important to note that, while influenced by other action movies, The Accountant is one of those rare original ideas that filmgoers have been craving for since franchisemania has swallowed Hollywood whole. There are interesting ideas and elements in the script by Bill Dubuque (The Judge) and he wisely keeps the mysterious parts of the story element hidden so that the audience sticks with it. 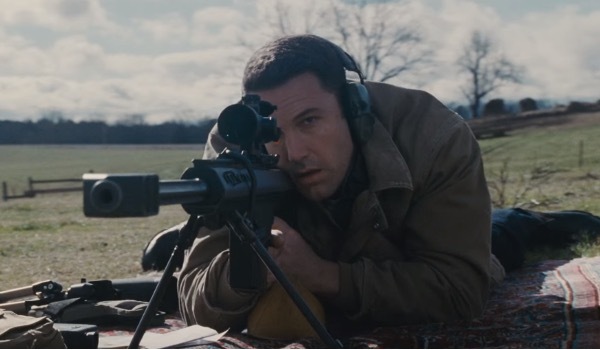 Sadly, The Accountant succumbs to an abundance of anti-climactic ends to its story threads. There is almost zero interaction Simmons and Addai-Robinson have with the main story, and their closing moments are wrapped up in a drawn out form of exposition and a boring press conference at the film’s end. That’s not even including the involvement of John Lithgow and Jon Bernthal in the movie, who are practically filler to make the two hour runtime. Even Chris’s own story feels incomplete, like it doesn’t know how to finish off making the character fully rounded. Is he a good guy? A bad guy? Misunderstood? Seeking redemption? Wrong place, wrong time? The character of Chris himself might also draw attention, as he has high-functioning Autism. He doesn’t understand sarcasm and has trouble with being polite in conversation, but he’s brilliant with numbers and stone-cold when it comes to killing. To the film’s credit, Chris’s condition is not treated as a crutch and not glorified as the reason for his talents. The movie doesn’t even identify his condition until an hour in, and it’s not highlighted or given special drama. It’s just who Chris is and he deals with it in his own way, and that’s commendable for the movie to do. Commendations should also be given to director Gavin O’Connor (Miracle, Warrior) for actually managing to construct a solid atmosphere in the needlessly-complex mess. He and cinematographer Seamus McGarvey (The Avengers) shot the movie with a pale blue overtone and a near-constant sense of unease while Chris works numerical wonders and shoots up a lake house. It’s like if David Fincher directed a Bourne movie, complete with occasional shaky cam fight scene and some well-staged shootouts. O’Connor thinks he’s making some grand thriller by way of a R-rated action movie, like if The Insider had James Bond in it. Sadly, the mostly dull script and twisting story don’t do his work justice and he seems as lost in the narrative as the audience. That’s not to say he doesn’t try to savor his talented cast. Affleck, seven months off of his inaugural run as Batman, seems to really get the character of Chris down as stoic but still hiding something underneath. It also shows that Batman training has paid off considering how great he does with the action scenes. Kendrick is typical Anna Kendrick, though it does provide for some funny scenes with Affleck. Simmons acts like he’s asleep in every scene he’s in, but at least Addai-Robinson has the decency to carry the scenes she’s in with and without him. Bernthal is so cool and charismatic in this that it’s actually the biggest waste of the movie. Maybe he’s the star that action movies have been waiting for, a cocky tough guy with just the right amount of emotional investment in something he knows is just fancy gun fights. Oh and Lithgow and Jeffrey Tambor are in this….and then they disappear with no mark left on the story at all, so hopefully they were properly compensated. The nicest thing to say about The Accountant is that it’s a very nice looking try. This may sound a bit demeaning to the action movie considering how far it’s come since the heyday of Stallone and Schwarzenegger, but maybe the genre needs to lower its standards a bit. Perhaps competing with capes, magic, and laser swords is too much pressure on the action genre. There has to be some kind of middle ground between trying to hard and not trying hard enough, though you won’t find it here. This entry was posted in movie, Movie Review and tagged action movie, Anna Kendrick, Batman, Ben Affleck, Jason Bourne, John Wick, The Accountant, The Accountant movie review. Bookmark the permalink.